foodnutzz...by nature & nurture! : I feel like Tagine tonight! I feel like Tagine tonight! 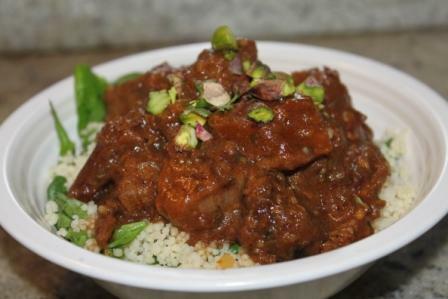 A cold evening and my mind is dreaming of slow cooked lamb with sensual sweet flavours of Morocco.....Lamb tagine. The writer Edmond Amran el Maleh described Moroccan cuisine as "the perfumed soul of our culture", and he is so right. My tagine would combine these Moroccan flavours with the richness of lamb. I imagined mixing the sweet delicate scents and flavours delivered by cinnamon, cardamom and saffron, balanced with pungency of ginger and garlic, the earthiness of cumin and coriander seeds, the sweetness of dates and honey all slowly simmered to deliver a combination of sweet and savoury ......that I don't belive any other cusine really delivers. The challenge for this food dream to become realitky is that tonight I am at Mr G's, whose pantry is as limited as Mrs Hubbard's! Normally that could spell disaster for a foodie, however thankfully there's a great IGA around the corner for me to source the ingredients to create my dish. Personally I'd have prefered to head to Herbie's , as he has the freshet and purest spices in Sydney, but unfortunately Ian's not open at 7.30pm on a Saturday and I don't think he'd appreciate a desperate call!!! Another culinary challenge is Mr G's kitchen is also not well equipped. Normally I'd cook this dish in my Le Creuset, and although I have been slowly building Mr G's kitchenware collection alas the budget doesn't quite allow for me to buy another Le Creuset. So today I made this tagine in a typical non-descript everyday saucepan, that most of Australia would have in their homes, and it still delivered a sensational result. Many tagine recipes add the dates right towards the end of cooking to allow them to still retain their shape, however I love it when they collapse down which not only adds more body and texture but gives a deliciously rich caramel sweetness to the whole dish. If you find this dish a little too sweet add some preserved lemon or a squeeze of lemon at the end, to balance the sweetness to your taste. Heat oil in a large saucepan, or flameproof casserole dish over medium heat. Add onion, ginger and garlic and cook for 5 minutes until golden and soft. Stir in dates and honey and cook for a futher 20 minutes, stirring occasionally. Season to taste with salt and pepper. If the tagine gets a little too thick during cooking, add a little more beef stock. To make couscous, bring 1 1/2 cups water to the boil in a medium saucepan. Stir in olive oil and couscous. Cover, remove from heat and let stand for 5 minutes. Fluff with a fork, then stir in spinach. Divide tagine and couscous among serving bowls. Sprinkle with coriander and pistachio kernels.